Political prisoners Atena Daemi and Golrokh Iraee Ebrahimi were illegally transferred to a prison with inhumane living conditions in January 2018. Imprisoned civil rights activists Atena Daemi and Golrokh Iraee Ebrahimi are being denied medical care in an Iranian prison known for its inhumane living conditions, the Center for Human Rights in Iran (CHRI) has learned. Daemi’s mother told the Center for Human Rights in Iran on March 13, 2018, that Ebrahimi had lost about 13 kilos (28.6 lbs.) and become very weak from a six-week-long hunger strike, but prison and judicial officials were ignoring both of the women’s medical conditions. “Sometimes I think they want to kill my girl. Every time the phone rings, I expect to hear bad news,” said Nemati. Iraee, who has been serving a six-year prison sentence since October 2016 primarily for writing an unpublished story about stoning, says she has been on hunger strike since January 25, 2018, in protest against the move. 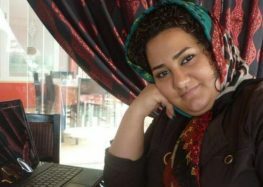 Daemi, serving a seven-year prison sentence since November 2016 for charges including criticizing the Islamic Republic of Iran on Facebook, broke her hunger strike after several days for medical reasons. Political prisoners in Iran including elderly inmates are singled out for harsh treatment, which often includes denial of medical care. The threat of withheld medical care has also been used as an intimidation tool against prisoners who have challenged the authorities or filed complaints. Gharchak Prison is located near the city of Varamin, 37 miles south of Tehran. In seven wards, it holds more than 1,000 female prisoners in cramped, unsanitary conditions. Daemi and Iraee were originally imprisoned in Evin Prison in Tehran before being forcibly moved to Gharchak without prior notice in late January 2018. The transfer violated Article 513 of Iran’s Criminal Procedure Regulations, which stipulates that convicts should serve their terms in prison facilities in the judicial district where their sentences were issued or near their city of residence—in this case, Tehran.